Harley is trapped in S.T.A.R. Labs with no escape! Abandoned and alone, the former Clown Princess of Crime must face down a horde of invading interdimensional aliens... but is she locked in there with them-or are they locked in there with her? The Suicide Squad: they're the D-Team, the expendable ones that can be sent on the most deadly missions because it doesn't matter if they come back -- after all, they are the DCU's most hardened (and talented) criminals. 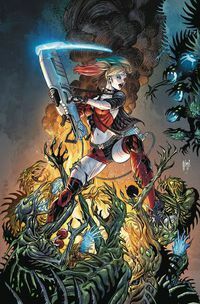 Whether you're looking to join the ongoing adventures of the Suicide Squad comic book series with the ever-changing lineup, or looking to learn a bit more about off-the-wall characters that will be featured in the upcoming film, you're in the right place for Suicide Squad comics and more! Legal Notice: Entire contents trademarked (® or TM) and copyrighted (©) 1986-2019 by Things From Another World, Inc. and respective copyright and trademark holders. All rights reserved. Page rendered at 2019-04-19 07:39:21 in 0.413 seconds.